Update X23 version (10.2.3) is made for patch X20, it can update any version you have starting with X20, no need to remove or install older versions. Please read the release notes before downloading or installing smoke patch or updates. 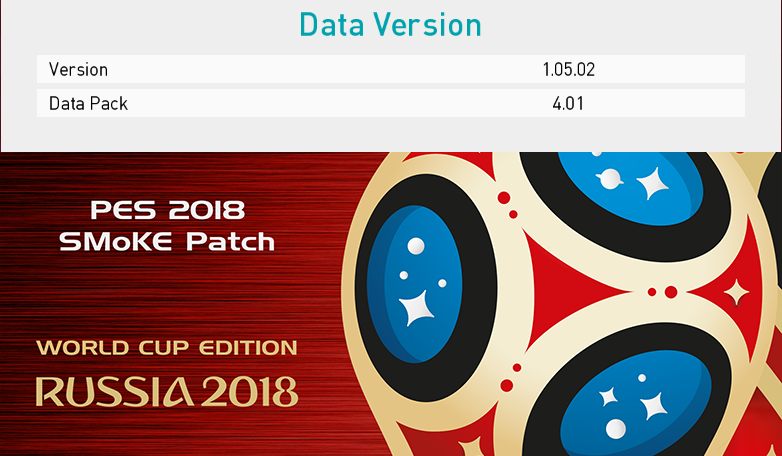 Konami released multiple data packs and game versions lately, every time this happens some files have to be modified to accommodate these updates, this would also result in malfunction with some game version. Update X23 have a reworked system files included to make sure all games are compatible without any additions. In previous versions we got reports about some bugs in the game (examples: Nigeria crash when making a sub), these issues is now resolved. other enhancements regarding players attributes, bugged faces, missing kits and similar issues is now resolved. Some players where not present in our database for the world cup, now they are added to smoke database and assigned to their respective national teams. Reports about some of the classic players appears in master league even with the option is turned off, this issue happens if the master league started with version X21, and should not happen with this version after the teams system files is reworked. Please note that editing the patch with an external editor will result in this issue, external editors are made to work with standard game teams and would not correctly configure the classic teams and results in classic players appearing in master league, using external editor is not recommended. * nothing else is required. 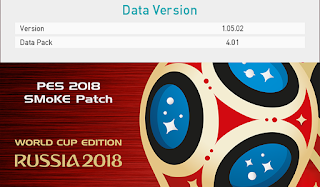 Install this software following install instructions, this is a full (all in one release), no need for previous versions, small software updates will be made after the world cup begins. All teams get reviewed at some point, leagues transfer windows are different depending on the continent, so a constant review is required. world cup national teams are set provisionally, after the official call ups for all the teams is announced we will make a small update to finish up. All the teams in the game have their real flag, stadium name, team colors, manager and other team attributes, we change and correct any missing details as we go. Players stats are from latest konami live update, players added from the patch have correct stats as well. A lot of players added to the patch, specially youth teams, the players database is getting bigger everyday and we include more players in each version. We made real kits for all the teams, updated as much as possible, the world cup teams kits are up to date for the world cup, if we missed any then we will include in updates. some kits are not precise due to lack of information. A lot of stadium effects are added to the game, specially fans chants, all sound effects files are located in the container (smkdb_sfx.cpk), if for any reason you want to remove the sound effects then just copy one of the extra cpk files to the same name mentioned and replace. Smoke patch replaces the three fake leagues with real leagues, currently added (bundesliga, liga aguila and CSL), new leagues have correct attribution and works just like the leagues already in the game. a lot of real balls, boots and gloves are added to the game, we do not update them all the time because that would be a waste of time, however this version have update ball models for the new season, boots and gloves also got updated to include the latest models. this version have new graphics, a special scoreboard is added along with the new backgrounds, you can remove to change the scoreboard by using the smoke scoreboard switcher from smoke patch add-on menu. Buona, decisamente buona nell'insieme... Molto carina la possibilità di giocare con un sacco di nazionali non previste nel gioco originale. Per esempio, se qualcuno ce l'ha installata può controllare la maglia blu della Grecia? A me risulta col colletto sbagliato (ha il colletto tipo "polo" ma dovrebbe essere un semplice collo a V, senza colletto né nulla). su pò fare su ps4 per aggiungere le nazionali?